Some years ago I prepared a menu in the Culinair-historisch Kookmuseum (‘culinary cookery museum’) in Appelscha in the North of the Netherlands, consisting of medieval recipes with marrow from first course to dessert. The menu was called To the bone (Tot op het bot). The recipe below was one of the dishes served. 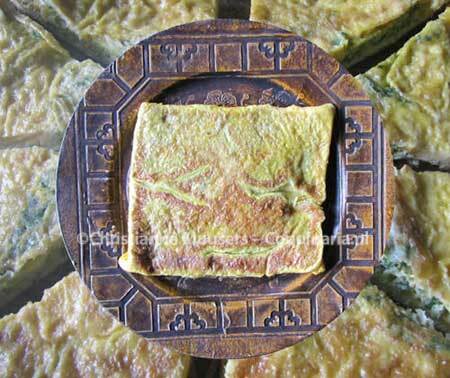 It is a recipe from the fifteenth century for a square omelette, stuffed with egg yolks, parsley, ginger and marrow. The source is the English manuscript B.L. Harleian 279 (1435). This cookery book was published in 1888 together with some other cookery texts by Thomas Austin, and again in 1990 with a translation by Cindy Renfrow. Other medieval recipes with marrow on this site: small pasties (there you can read more about marrow) and stuffed quinces. A recipe from the eighteenth century with marrow: sweetbread pasties. 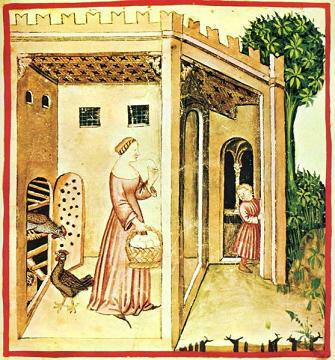 The medieval omelette on this page is called Hagas de Almaynne, a name which raises some questions. According to Cindy Renfrow (Take a thousand eggs or more, pp.310) the literal translation is ‘German haggis‘. The recipe can be found in several English fifteenth-century cookery books: manuscripts British Library Harleian 279 (the version I used here), British Library Harleian 4016 and Yale University Beinecke 163, and the first printed English cookbook A Noble Boke of Festes Ryalle and Cokery(1500). There are two earlier manuscript versions of this cookbook (Holkham 674 is one of them, see below). In manuscript Harleian 4016 this dish is called ‘haggis with almonds’ (Hagas de almondes). However, the recipe is not German, it does not contain almonds, and it is not haggis as we know it (the heart, liver and lungs of a sheep, prepared in its stomach, see below). Etymologically haggis seems to be related to Dutch or German ‘haksel’, chopped stuff. That could be referring to the chopped stuffing of the omelette. The other word in the recipe title, Almaynne (German), is harder to explain. I have perused several German cookery books from the fifteenth century (see * at the bottom of this page), but found no omelette stuffed with yolks, parsley and marrow. What they did appreciate were whole eggs, roasted on a spit (look at this recipe if you wonder how they did that). All versions of this ‘haggis‘ give clear instructions how to turn a round omelette into a square one by folding back the edges over the stuffing at four sides. In two recipes (in manuscripts Yale University, Beinecke 163 and Holkham 674) the centre of the omelette is covered by pouring an extra egg over it and let it consolidate. With or without extra egg on top, the omelette is turned over in the skillet before serving. The result is a stuffed omelette shaped like a square pillow with the seams underneath. In the manuscript I used as the main source for this dish, B.L. Harleian 279, the recipe is in the section called Leche Vyaundez, or Leche Metys as it is called in the index of the manuscript, with roasted, fried and deep-fried dishes. The first section is called Potages dyuers (boiled dishes and sauces); the third and last section dyuerse bake metis (baked dishes). All three sections contain dishes with fish, meat, game, vegetables or dairy. In the Middle Ages the word ‘mete’, meat in modern English, had the wider meaning of food or even meal, just as ‘vyaunde’ or ‘viande’ (‘meat’ in French). The Dutch word proviand (‘provisions’) is a relic of this obsolete meaning. The meaning of ‘leche’ is more difficult to explain. The Middle English Dictionary does not give an applicable meaning, and glossaries in editions of Middle English cookery books only mention ‘slices’ or ‘in slices’ and cite some recipe titles of dishes with no slices whatsoever without offering an alternative meaning. So I thought: could leche be related to the Dutch (or German) word ‘lekker’ (tasty, pleasant, nice)? 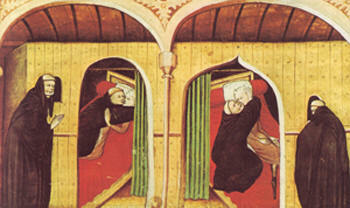 According to the Collins English Dictionary the word lecher is derived from Oldfrench lecheor in the twelfth century. And lecheor is related to lechier, ‘to lick’. The Dutch adjective lekker (‘tasty’, ‘delicious’) is derived from an older version of ‘likken’ (‘to lick’). So, Leche Metys and Leche Vyaundez could both mean ‘delicious dishes’. However, sometimes leche just means ‘slice’, as in the recipe from the same section for Storioun leche, that is not a sturgeon, but a fake sturgeon of pressed veal that is served in slices (in section Leche Vyaundez recipe xv). The recipe from B.L. Harleian 279 is cited from the 1888 edition by Thomas Austin (p.44, see bibliography), for the translation I also looked at the edition and translation by Cindy Renfrow (p.310, see bibliography), but mine is less verbatim. Other recipes from this manuscript on Coquinaria: Strawberry pudding, Apple fritters and a Fake hedgehog. Take fair eggs, the yolk and the white, and draw them through a strainer. Then take good parsley and steep it in a pot with boiling broth. Then take the yolks of hard-boiled eggs and chop the yolks and the parsley finely. Then take sugar, powdered ginger and salt, and add it. Then take marrow and put it in the tip of a strainer and let it hang into a boiling pot. Parboil it, take it out, let cool and cut into small pieces. Then take the drawn eggs and cover the surface of a barely greased pan completely. Put the yolks and parsley on it in the pan and then put the marrow pieces on it. Fold up each ‘cake’ in a corner back into a square (? ), flat, and turn it once in the pan. Leave it for a while, then take it up and serve. In my adaptation I have used an extra egg to cover the stuffing (as in some of the other medieval versions, see supra), but you can choose to forgo that. The parsley is used raw. I mixed the chopped marrow in with the egg yolks. And, because English cuisine frequently uses animal fat, I have fried the omelette in lard. For 6 to 8 persons as side dish or first course, for 4 persons as main course; preparation in advance 15 minutes; preparation 10 minutes. Beat four eggs together in a bowl, beat the fifth egg separately. Because the stuffing is already salted, you do not need to add salt to the beaten eggs. Chop the hard boiled egg yolks and parsley and add sugar, ginger and salt. Prepare the marrow as described below. Boil fifteen minutes in water or broth. Push the marrow out of the bones, chop finely and add to the stuffing. Lightly grease a pan with lard or suet and heat it. Pour the four beaten eggs in. Wait until the omelette starts to set underneath but is still moist on top, and sprinkle the spiced egg yolks and marrow in a square on top (see photo on the left). Fold the edges of the omelette over the stuffing, and pour the fifth egg over it (see photo on the right). Cover the pan, or place it in the oven with heat from above so the top of the omelette will set. Turn it once, and leave for a few moments. Turning the omelette – Because of the folding, the stuffing and the added egg on top, it is wise not to turn the omelette by throwing it up in the air. Just slide the omelette onto a cover, or use two large scoops to transfer it on the cover. Add some extra grease to the pan, hold it upside down over the cover and turn both over in one movement. Put back on a slow fire for a minute. Present the omelette warm on a decorative dish, whole or divided into slices. Add 2 tablespoons of butter to the stuffing instead of marrow, and fry the omelette in butter instead of lard or suet. A savoury pudding containing sheep’s pluck (heart, liver and lungs) with spices, oatmeal and suet, originally boiled in the animal’s stomach. Modern haggis is often prepared in sausage casing. Although this dish is mainly identified with Scotland, this manner of preparing offal in a stomach is much older. According to Alan Davidson (The Oxford Companion to Food) this kind of dish is already mentioned in Roman antiquity, when organ meat was prepared in a pork caul. This way, the offal that would be spoiled within a day could be kept for weeks. The word ‘haggis’ is probably derived from an old German or Scandinavian version of ‘hacken’ (to chop). So, you could regard haggis as a large meat ball of organ meat with grains. In the recipe on this page ‘haggis’ means ‘chopped food’, the chopped boiled yolks, parsley and marrow in the stuffing. Jennifer McLagan, Bones. Recipes, History, and Lore. 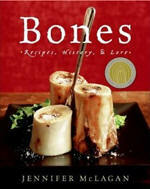 (2005) In 2008 republished as Cooking on the bone. Yale University, Beinecke 163, edition: An Ordinance of Pottage: An Edition of the 15th Century Culinary Recipes in Yale University’s MS Beinecke 163 . Constance B. Hieatt. (Londen, 1988). Mrs. Alexander Napier, A Noble Boke off Cookry ffor a Prynce Houssolde or eny other estately Houssolde, London, 1882. Online edition. C.B. Hieatt warns against the unreliability of this edition. There seems to be published shortly a facsimile edition of A Noble Boke of Festes Ryalle and Cokery (1500), which is relatd to the manuscript. This is the first English cookery book that appeared in print. * Consulted: modern editions of the following manuscripts: Staatsbibliothek Berlin Ms. germ. fol.244, Münchener Staatsbibliotek, Cgm 349, 384, 467, 725, 811 and Clm 15632, Universitätsbibliothek Basel, AN.V.15, Universitätsbibliothek Basel, ÖUB D II 30, Universitätsbibliothek Heidelberg, UB cpg. 551 ff 186r-196v en 197r-204r.